"Bristol: Mt. Hope Bridge & Roger Williams University (Aerial)" by Chester Smolski, Kent, Cruise and Associates et al. Aerial image of Roger Williams University and the Mount Hope Bridge in Bristol, Rhode Island. The Mount Hope Bridge was constructed between 1927 and 1929. In 1956, the college purchased this waterfront land just north of the bridge in Bristol and became a two-year institution named Roger Williams Junior College until 1992 when it was renamed Roger Williams University. Bibliography: Jordy, William H. "Buildings of Rhode Island" Oxford University Press, 2004. p. 480. Smolski, Chester; Kent, Cruise and Associates; and Robinson and Steinman, "Bristol: Mt. 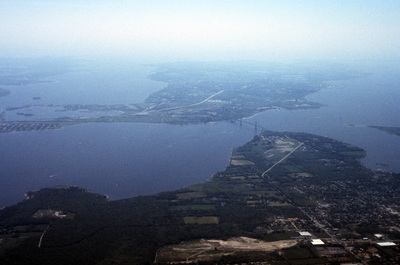 Hope Bridge & Roger Williams University (Aerial)" (1978). Smolski Images. 1027.